A Coach: One of my clients said to me the other day “You believe in me more than I believe in myself.” We need people in our lives who do believe in us and are willing to hold us accountable for creating the success of our business that we envision. Having a coach in your corner doesn’t mean weekly sessions and a big layout of cash. A coach, as a thinking partner, is there when it makes sense to talk with someone who can hold the bigger picture for you, with clear, focused vision for you and your future. They are going to hold you to your vision – if that’s what you want. Have just one coaching session with a business coach and see what happens. Contact Me! A Social Media Consultant: Marketing is changing. Its focus is now on building relationships with people, who, in time, become your customers. A good social media person focuses on your specific needs for engaging with the world. Local to global, they work with you to create the visibility you need. That visibility cultivates trusted relationships, which inevitably mean more of your products and services bought by those who see the value of what you bring to the world. We all want to be seen, trusted and valued. This to me is now a no-brainer. And, just to share, here are my stats for this week alone: On Facebook, Likes – Up 4%, Reach – Up 111%, and Engagements – Up 108%. Its working! A Web Person. Where the social media consultant is establishing and maintaining relationships in the world for you, your web person keeps an eye on your Home Site, where people come to visit. What do you want to offer to people who visit? What is the feel of the space they arrive into: Coffee, Tea, and engaging content, and offers to work with you? But of course! A good web person, in a sense keeps the home fires burning, cleans up and archives old material, perhaps creates new pages to visit and enjoy. They make you look good, and we all need that. A Bookkeeper: If managing money is a challenge for you, like it is for me, find a solution that will assist you in having a better relationship with this part of your work. There are some great computer programs to assist you in bookkeeping. And, like every other tool in the world, they only work if you use them. Having a real person, even if they are virtual, can assist you in staying in right-relationship with the flow of your money. Again, you might not be ready to hire a full time bookkeeper, but having one close by to assist is a good thing. My support team is growing. And, they are collaborating so that what shows up as Dr. Rosie, and The Paradigm Shifts Coaching Group, is consistent, clear and fun for everyone. They are also beginning to collaborate together, for other clients too. 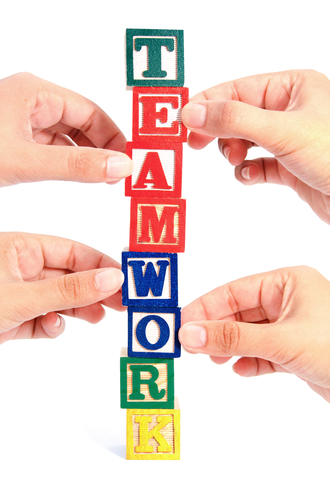 A good working team respects and delights in each other’s talents, gifts and successes. They are happy to work together and to refer clients to each other. Everyone wins by hiring the right people. Hire someone who loves what they do. Give the job to your Aunt Suzie, only if she is passionate about what she will be doing for you. I have often hired people who are just starting up their businesses. They are usually inexpensive, to begin with, because they are learning while they are working. And, most importantly, they have the enthusiasm that gets the job done. Hire interns from community colleges and even from online colleges and Universities. People need business experience and you may be offering someone a chance to practice their skills and tools at the ground level. A simple law of business – I find, anyway, is that the more money that you make, the more you spend on creating more business. So, start to think about who could support you, now, doing what you love, while they do what they love, only in service to really having what you say you want. Have fun! *** Here are a few of my team members you may consider hiring: Social Media Consultant, Elissa Fesyk: www.fesyksolutions.com; Web Guy, Armando Nunes: www.anunesmedia.com; Graphic Artist (another important member to have on your team, Maureen, www.onfirecoaching.com. Who is Dr. Rosie? Dr. Rosie Kuhn is a preeminent thought leader in the field of Transformational Coaching and Leadership Development. She is available for Speaking Engagements, Coaching Sessions for Individuals, Organizations and Executives, as well as Trainings. Her books can be found at Amazon.com. And, be sure to check out many of her other blogs as www.theparadigmshifts.com . Call me if you’d like to talk about scheduling a session: 360-376-4323.